Signups for season 3 are now open! Signups for Ready Steady Pan season 3 are finally open! We're very excited for all the frying pan action throughout the season, but one thing you may be asking yourself is "where do I signup?". 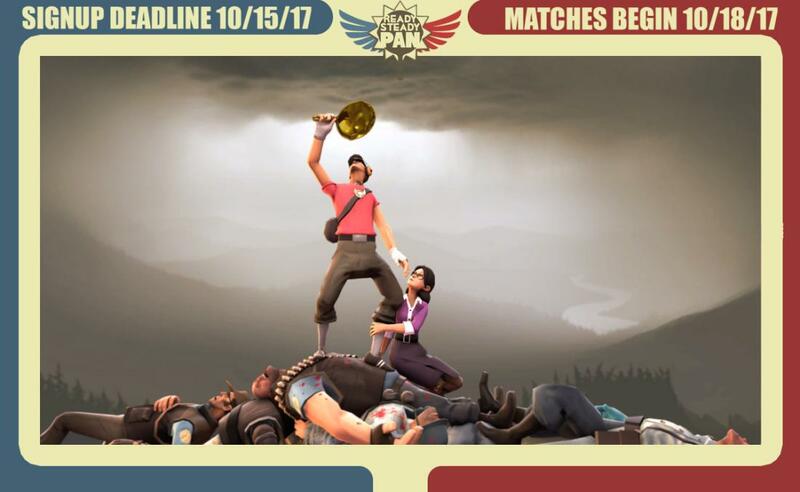 The website is open for team and user registration over at Pan.tf, where you can also look for teams and players on the forums. The signup date for teams starts on October 1st and ends on October 15th, so be sure to get your teams ready for the ultimate pandemonium that is Ready Steady Pan! Ready Steady Pan is a semi-competitive league involving the frying pan as the only damage dealing weapon allowed. After two overwhelmingly successful seasons, and after a “short” hiatus (yeah, we know), we have returned for Season 3, thanks to /dev/zero for a massive help with Citadel framework support. What about the medals you may ask? We know that everyone loves medals and we did everything we could to provide high quality pins for both participants and winners. However, it's always up to Valve to decide if we are getting those cool green-framed items in the game, so we won't make promises. But we can say that the medals are finished and waiting for approval in the Steam Workshop. If you want to connect with others participating in the season or want to get in contact with the many helpers that are volunteering, you can check out our discord server below.